Thank you Maxim Enterprise Inc for sponsoring this post; however, all thoughts and opinions expressed are my own. These are concepts we can start working on with our children early on. Learning can and should be fun, so I wanted to round up some toys great for Christmas, birthdays or potty even training prizes! 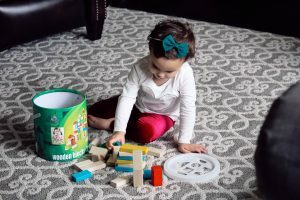 These blocks are amazing for little busy brains. As soon as your child is 2 you can start working with them on these skills, just be mindful of small pieces going in their mouth. If they are still putting little things in their mouth I’d hold off a bit longer. I love these blocks for little engineers in the making. Work with your child on creating short and tall buildings, big and small and even square and rectangle shapes to bring math concepts into play. Trains are a favorite for every child it seems. Something about creating a track and moving the train around on it is magical to children. Not only is it fun to play with wooden trains, but educational. Their minds are taking in how to build and connect tracks & also keep the train on the tracks when pushing it around. These blocks are classics and simple enough that they are great for beginner or advanced engineers. 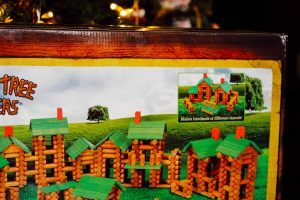 Unlike the Tumble Tree Timbers they are much easier for children to learn how to build with and are a great starting point. Another great starting block for younger children. Staking blocks is an early skill for children to work on and these little squares are perfect for that. Not to mention they also allow children to work on their letters and colors. Izzy loves this toy! It really allows her to work on counting skills when we ask for specific numbers of each fruit. She loves bringing it to different toys around the house and having them come to her market to buy fruit. I also love the fact that she’s leaning about having a business. Plus this wooden toy is even more swoop worthy in person! Thanks for sharing such a beautiful assortment of toys! LOVE that fruit cart. My kids would have so much fun with that. Ohhh, I LOVE the fruit cart! My daughter would love pushing it around all day! These are the best! STEM toys are almost the only toys that keep my oldest entertained. That fruit cart is absolutely amazing!!! Isn’t it too cute ?? 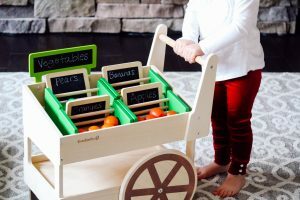 I love keeping STEM toys around the house and I absolutely ADORE that fruit cart!! SO cute!